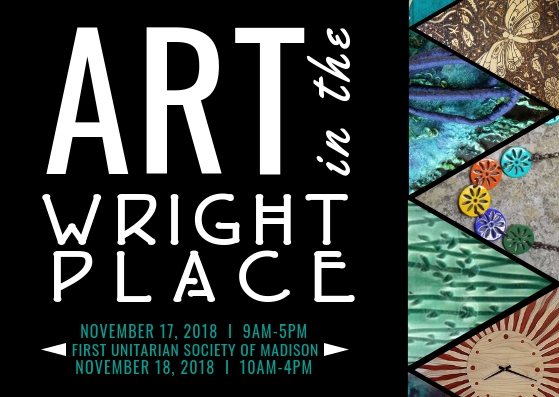 First Unitarian Society (FUS) invites you to participate in Art in the Wright Place, an annual art sale housed in the historic Frank Lloyd Wright Unitarian Meeting House. This sale features original fine arts and crafts from over 45 Wisconsin artists. First Unitarian Society is located in scenic Shorewood Hills, close to the University of Wisconsin and across from the American Family Children’s Hospital. Our congregation has approximately 2000 members and affiliates, and our event is publicized through several local and statewide channels. Previous media have included fibre arts, photography, jewelry, pottery, woodwork, basketry, art glass, watercolors, and more. Eligibility is based on craftsmanship, originality, creativity, and balance of media. Participation is open to artists ages 18 and older. All work must be the artist’s original design and execution. Artists must be present for the duration of the sale; early pull-outs are not allowed and spaces are non-transferable. All artists—new and returning—must submit digital images to leslier@fusmadison.org by the application deadline. Booths The unique architecture of FUS does not lend itself to consistent booth sizes. We have 52 booth spaces that are sized to fit each unique area of the building. You will request a specific size when you apply, and we will do our best to accommodate your request. A diagram of the three sections of the building where artists set-up is included here, along with the booth sizes at each space. PLEASE KNOW WE CAN’T ASSURE YOU THE SPACE YOU HAVE REQUESTED AND PAID FOR. We will contact you to negotiate a suitable space if we cannot fulfill your request. Any booth space that is along a wall or window must have its table or display flush against the wall or window to accommodate our customers’ pathway. You may reserve a 6’ x 30” table or bring your own display. All artists must bring additional lighting for their space. Fees are dependent on booth size, as listed on the application. Artists also pay 15% of their total, non-taxed sales to FUS as part of their participation fee. Your booth fee must accompany your application. Booth fees for accepted artists are non-refundable. Artists who do not receive the space they requested will have their fee adjusted accordingly. Publicity We will have a large banner on the pedestrian bridge crossing Campus Drive, and will advertise on WI Portal, visitmadison.com, and other web-based event sites. We will also have print and electronic ads in the Isthmus. It will be promoted on our website and social media. Electronic and print postcards will be sent to artists to distribute at their sales, and through their mailing lists and social media. Your application will not be complete until you have submitted photos to Leslie at leslier@fusmadison.org and have paid your booth fees.